Beginning in 1970, Zoroufy first brought beauty to homes with their fine oriental rugs and tapestries. Knowledge of design and appreciation for the art of oriental rugs came naturally for its founder, Hassan Zoroufy, as this information had been passed down for generations from his family's experience in the rug trade. During the early 1980's, consumers began trading in their wall-to-wall carpeting from earlier decades for the timeless appeal of wood floors. The demand for runners and area rugs soared. Zoroufy's customers shared photos and expressed great interest in the beautiful turn-of-the-century staircases featuring elegant runners, stair rods and stair clips. Convinced demand for these stair rods and stair clips to accent runners would intensify; Zoroufy began manufacturing them directly for its customers here in the United States. In 1984 the first patented Zoroufy product, Stair-Hold, was created as a direct response to customer demand. 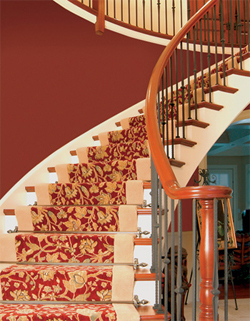 As stair accessory products continued to grow in popularity with floor covering retailers and homeowners, Zoroufy responded to their needs. In 1991, the first Zoroufy catalog featuring a variety of decorative accessories was printed and delivered nationwide to retailers throughout the floor covering industry. By consistently offering quality product and service to its customers, Zoroufy has grown into an international brand name recognized throughout the United States, Canada, and Europe. Its primary office remains in Middleton, Wisconsin. Family owned and operated, the Zoroufy name continues to thrive on the values that first made it a success. We listen to our customers and bring them beautiful and unique products encompassing a wide range of styles that complete any home, office, hotel, church, or school. Our customers' needs are endless. Zoroufy products are timeless.